By Adam Hermann·	 1/22/2016, 10:00 a.m.
After spending 13 years as an NFL player, Frank Reich has been coaching since 2006, when he broke into the league as an offensive assistant with the Colts. He’s had an up-and-down 11 years in a number of different roles. To get a grasp of where his offenses have succeeded, and failed, we’ve put together a few numbers to help you contextualize the Eagles’ new offensive coordinator. 92 — The number of touchdowns Philip Rivers threw in Reich’s three years with the Chargers, one as quarterbacks coach and two as offensive coordinator. His 92 touchdowns (32 in 2013, 31 in 2014, and 29 in 2015) tied the best three-year stretch of his 12-year career. Rivers’ 29 touchdowns this past season are noteworthy considering the offense was missing his top target, Keenan Allen, for half the season. Allen finished the season with the most touchdowns by a Chargers wide receiver with four despite playing just eight games. Instead of forcing the ball to underwhelming receiving options, Reich and Rivers worked to get the ball to running back Danny Woodhead, who caught six touchdowns, and Antonio Gates, who caught five. With the Eagles’ seeming lack of breakout depth at wide receiver, and an abundance of pass-catching skill at the tight end and running back positions, it will be interesting to see if Reich applies the same approach to the Birds’ offense in 2016. 661 — The number of passes Rivers threw under Reich’s coordination in 2015, a career high by 79 attempts. He threw just 13 interceptions, which amounted to a pick on just two percent of his passes throughout the season, the second-lowest mark of his career. His best season in terms of interception percentage came in 2009, when he threw nine interceptions, coming on just 1.9 percent of his throws. But that season, he threw 175 fewer passes than he did under Reich in 2015, an impressive feat. It’s especially impressive considering, in his first season with Reich as the team’s offensive coordinator, Rivers led the league in interceptions with 18 in 2014. 32nd — The Chargers’ league-wide rank in rushing touchdowns (4) and yards/rush (3.5) this past season. When the Eagles poached Ryan Mathews from the Bolts in free agency, their run game saw a significant drop-off as Reich unsuccessfully tried to employ a platoon approach with a couple of running backs. Admittedly, rookie back Melvin Gordon was hampered by ankle problems throughout the season, eventually being placed on injured reserve in December. But even when he was healthy, Gordon’s production was marginal at best, averaging 3.5 yards per carry and failing to score a rushing touchdown in 14 appearances during his rookie season. Woodhead saw production come in bushels through the air, where Rivers targeted him repeatedly, but the shifty veteran couldn’t find space on the ground, averaging 3.4 yards per carry. .419 — The career winning percentage of the quarterbacks Reich worked with during the 2011 and 2012 seasons, when he was the quarterbacks coach with the Cardinals and Colts, respectively. Reich had the misfortune of being promoted from the Colts’ wide receivers coach to quarterbacks coach in 2011, when Peyton Manning was out for the season dealing with neck problems. In Indianapolis, Reich was handed the motley crew of Curtis Painter, Dan Orlovsky and Kerry Collins, who threw for 14 touchdowns and 14 interceptions that season. It was an ugly sight. The next season, Reich headed to Arizona as the Cardinals’ quarterbacks coach, where the situation was equally jumbled. He had a four-man rotation to work with in 2012 featuring John Skelton, Kevin Kolb, Ryan Lindley and Brian Hoyer, who combined for a brutal 11 touchdowns and 21 interceptions over the 16 games. 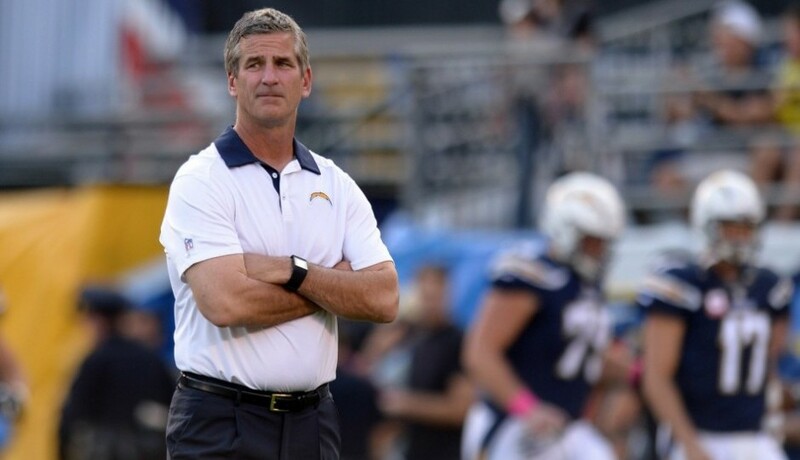 Despite the unimpressive numbers, with unimpressive talent, Reich earned the Chargers’ quarterbacks coach job in 2013, taking the same position with a third team in as many years.